Sharp MX-M3050 PCL6 Driver & Software for Windows 10, 8, 7, Xp (64-bit/32-bit) and Manual Installation- Sharp MX-M3050 is Sharp’s new mid-range monochrome (black and white) series. The speed of print, copy, and scanning of this model is 30 Pages per Minute and up to 80 images per minute scanning. This model has two standard paper tray that can fill by 550 papers, 100 sheet bypass tray, and also expandable tray that can fill until 6.300 sheet paper. Sharp MX-M3050 design with 10,1” hi-resolution touch screen color interface that can make us easier to control. Sharp MX-M3050 is designed with multi-layered security features. With Sharp remote device manager, the administrator can control the system features and simplify the installation. This type is also built in by auditing hardware and software to control, access and track the usage of the device. To help the employee’s privacy this device also armed with security features, such as data encryption, data overwrite protection, and data erase. 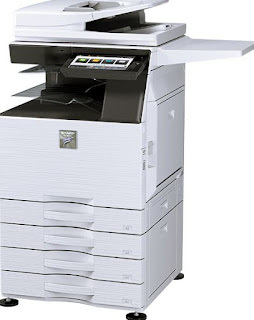 Authority group features can help to manage specific copying, printing, scanning and fax feature to control the cost. The admin audit log is the features that allow an administrator to track the activity of the device. Confidential printing and secure fax release help ensure that sensitive documents are kept safe by using the pin and the code at the box of Sharp MX-M3050if you want to print them.